Results of the South Australian Rainbow Survey 2015-16 are to be published on our website on 25 August 2017, to coincide with Wear it Purple Day. The annual South Australian rainbow surveys contribute to South Australia’s LGBTIQ Inclusion Strategy, which provides information about priorities for LGBTIQ South Australians. The 2015-16 Rainbow Survey will be a vital point of comparison for future research into South Australia’s LGBTIQ community. The results may inform planning or research in other areas, such as public health and safety, and community development. Wear it Purple Day seeks to raise awareness about issues facing young people and the need to eradicate bullying based on sexuality and gender diversity. 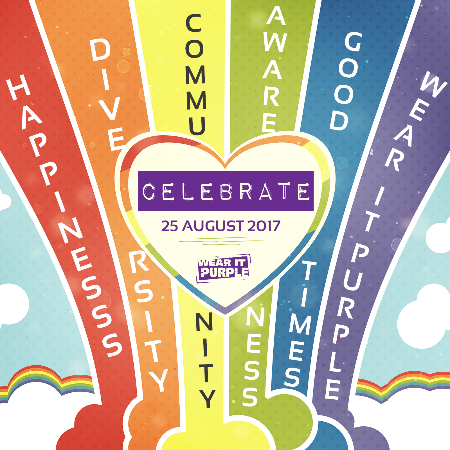 The day has a simple message ‘Be proud of who you are’, and encourages people to wear purple to show their support for safe and accepting environments.